Below you'll find some of my old writing on careers, finding work you love, and recruiting. The blog post below was written before the 2009 application deadline. My story, opinion, and advice are still the same. IMPORTANT NOTE: Applications for summer 2010 are due by Monday, March 1. But even if you're reading this only a day or two before the deadline, you can easily get your application in. It's on the web. The only thing that takes real thought or time is one very short essay response. You can do that in an hour or two, take a break, have someone read it, make some edits, and submit it...in less than a day if you hustle. "Economics for Leaders" [http://www.fte.org/students/efl/] is a one-week summer enrichment program for high school juniors held on 11 different dates and college campuses across the country. I attended Economics for Leaders back in 1999 (and to get there, I flew for the very first time - Southwest Airlines). Since then, I've helped my two younger brothers and ten other students from my little high school in Smallville, Kansas, attend Economics for Leaders programs at colleges all over the country. It is THE BEST summer program I know of for high school kids in terms of what they'll take from it, how little it costs, and its accessibility to everyone. In the mornings, students participate in fun, interactive games and lessons to illustrate basic economic concepts. The afternoons are devoted to outdoor, group activities designed to teach teamwork and leadership. Evenings are focused on personal development. Students are guided through self-discovery exercises and get advice from guest speakers on topics like college prep, career development, and beginning personal finance. I tell students there are 5 big reasons to attend Economics for Leaders (EFL). 1) Going to EFL will help you choose a college. - Visiting a new campus and experiencing the residence halls, cafeterias, athletic facilities, and surrounding city helps students know what they like and what they don't before having to selecting the school that's best for them. 2) Going to EFL will help you get into college (and win scholarships). - The most important thing for an admission committee is to see that a student has challenged herself and is prepared to succeed at their college. Going to programs like Economics for Leaders, which means giving up a week of summer vacation facebook-ing to learn something alongside talented, motivated students from across the country and not getting homesick in the process, is a great way to show that. 3) Going to EFL will help you get to go to college (especially if you want to go far away from home). -- If you wake up one morning in November of your senior year and ask your parents if you can go away to college in Hawaii for the next four years, the answer will probably be No! But if you start by taking your parents through the baby step of letting you go to Economics for Leaders for one week this summer, there's a much better chance of them supporting your decision to attend college in Florida next year. 4) The application is easy and good practice for next year's college applications. -- The only part of the application that takes a little brain power is an essay response -- limited to 500 words or less -- about a leadership experience you've had and the lessons you learned that you can apply in the future. Act fast! 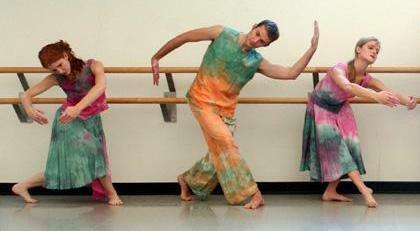 Application deadline for summer 2009 is this Friday, March 6. for summer 2010 is Monday, March 1. And of course, anyone you know is welcome to contact me for help. Click here or on the cover to see Recruit Or Die on Amazon. Listen to my first interview about the book. Or scroll down for links to more early media mentions. 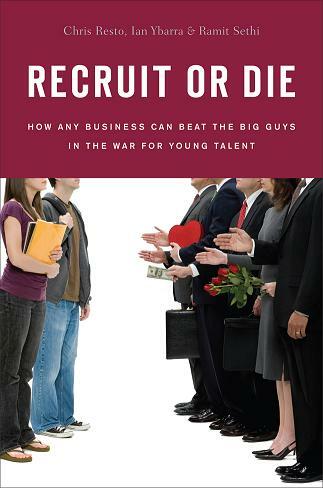 If you know anyone whose organization recruits young talent, please tell them about Recruit Or Die. Or introduce them to me directly (ian -AT- alwaysrecruiting.com). I'd be happy to talk recruiting with them. So proud of my friend Beau. Now performing with several professional companies in New York, he tells the Lawrence Journal-World how hard it was to overcome societal pressures to do what he loves. Beau Hancock lived in fear of those stereotypes as a boy growing up in the small southwest Kansas town of Hugoton. He was afraid of being teased. Afraid of being dubbed a sissy or called gay. Link: Lawrence Journal-World - "It's a man's whirl"
Just read this in Men's Health. Guy's name is Steve Belanger. I must admit, my life had been pretty comfortable. I was a vice president--one of hundreds, but still--at one of the largest corporations in the world. There was a lot of room for advancement. I had a nice office, an enormous expense account, and plenty of perks. I played more free golf on the country's top courses than my 19 handicap deserved. Three things to do now. 1. Read the whole article Men's Health - "Why I Quit My 6-figure Job"
2. Learn more about Steve at his website and this hilarious bio/story about his career actually living The Office. Letterman: When you were a kid...what drove you or led you to law? Edwards: I thought Perry Mason was cool. That and more in the video below (starts at 2:28 if you want to get right to it). 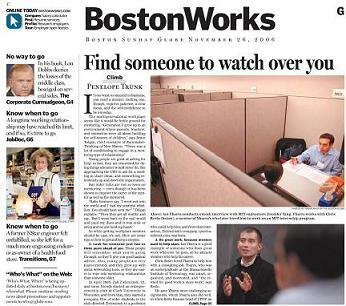 I'm in the cover story of the Boston Works section today (that's me in the blue, my friend Chris who built the largest internship program at MIT is in the black). It's about how mentors can help jumpstart your career. 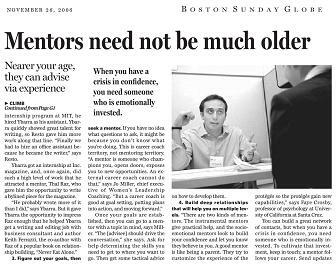 Link: Boston Sunday Globe - "Find someone to watch over you"
Link: Penelope Trunk - "Get good mentors by building relationships"
I knew nothing about woodworking when I started. He just knew he loved baseball. Now he's worked five years at Sambat, the company known for its maple bats that Barry Bonds and Albert Pujols use. Link: Popular Mechanics - "This is My Job: Baseball Bat Maker"
No, I will teach you to be rich. Why do I get chain letters like this from people at jobs they don’t like? Fire the tutors! Skip grad school! Wanna be the next Jerry Maguire? Trying too hard to be "professional"
Can't convince your family you're doing the right thing? "Sorry, I don't have business cards. I'm so sorry." Have you hit a Local Max in your career?